BIG SALE!! FENG SHUI DRAGON STATUES BIG SALE!! The dragon with Pearl is an ancient and powerful Feng Shui symbol directing prosperity, wisdom and good fortune to the individual or enterprise. Hong Tse stone resin sculpture with a polished antique gold finish. Traditional hand finished Hong Tse Red Chinese Dragon in 2 sizes to suit your decor. The dragon is the 5th year of the Chinese Zodiac 12 year cycle, the last being 2000. People born in the Year of the Dragon are energetic, excitable, and stubborn. Chinese Dragons are legendary for their strength, power, and fearlessness. Hong Tse stone resin sculpture with a highly polished Rosewood finish. 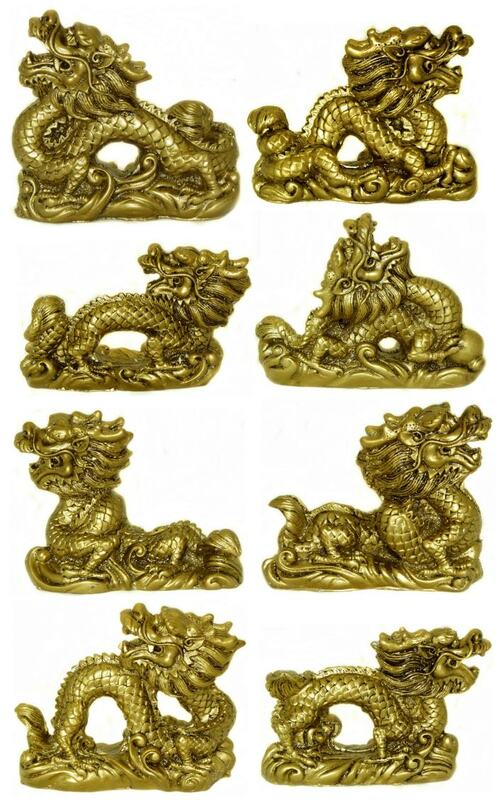 Traditional hand finished Hong Tse Gold Chinese Dragon in 3 sizes to suit your decor. Chinese Dragons are legendary for their strength, power, and fearlessness. Hong Tse stone resin sculpture with a polished antique gold finish. 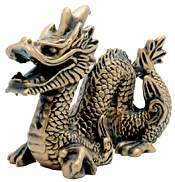 Stylized satin gold finish Feng Shui Fire Dragon figurine in solid polyresin. Chinese Dragons are an ancient and powerful Feng Shui symbol directing prosperity, wisdom and good fortune to the individual or enterprise. It is best placed in the living room, study or office in the East or Southeast corner. 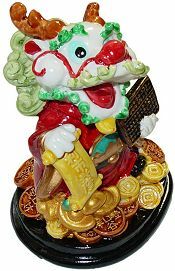 A colorful hand painted Chinese Good Luck Dragon stands over a mountain of lucky gold coins and gold ingots. He holds an abacus and Feng Shui scroll to close the books on the old year and bring good fortune for the New Year. 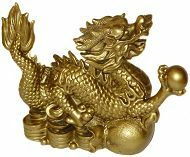 The dragon is one of the most powerful and auspicious symbols in Feng Shui and best placed in the living room, study or office in the East or Southeast corner. Hand painted solid resin Good Luck Dragon sculpture. Exquisitely hand painted, bright multi-colored Chinese Dragon Pair on clouds with red pearl, set together on a wood tone stand. The dragon with Pearl is an ancient and powerful Feng Shui symbol directing prosperity, wisdom and good fortune to the individual or enterprise. Hand painted cold cast resin sculpture. 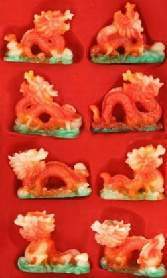 Traditional red Hong Tse set of 8 Chinese Dragons, perfect for placing strategically in home or office for protection and to increase good Feng Shui. Chinese Dragons are legendary for their strength, power, and fearlessness. Hong Tse stone resin sculpture with a highly polished Rosewood finish. Available in Antique Gold, Faux Jade & Colors. 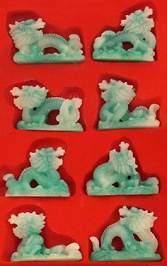 Traditional set of 8 Chinese Dragons in Faux Green Jade, perfect for placing strategically in home or office for protection and to increase good Feng Shui. Chinese Dragons are legendary for their strength, power, and fearlessness. Hong Tse stone resin sculpture with a polished Faux Jade finish. Available in Rosewood, Antique Gold & Colors. 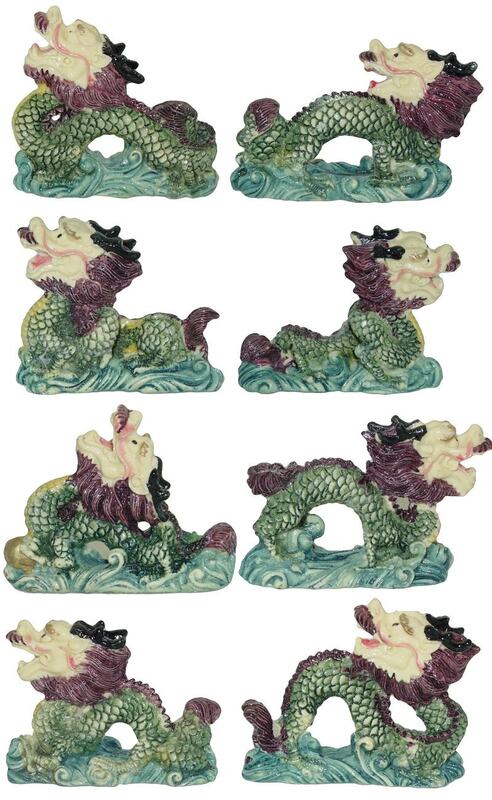 Traditional set of 8 Multi Color Chinese Dragons, perfect for placing strategically in home or office for protection and to increase good Feng Shui. Chinese Dragons are legendary for their strength, power, and fearlessness. Hong Tse stone resin sculpture with a polished color finish. Available in Rosewood, Faux Jade & Gold. Traditional red Hong Tse set of 8 Chinese Dragons, perfect for placing strategically in home or office for protection and to increase good Feng Shui. Chinese Dragons are legendary for their strength, power, and fearlessness. Hong Tse stone resin sculpture in Antique Gold finish. Available in Rosewood, Faux Jade & Colors. 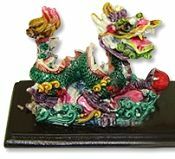 Traditional hand painted set of 8 Chinese Dragons, perfect for placing strategically in home or office for protection and to increase good Feng Shui. Chinese Dragons are legendary for their strength, power, and fearlessness. Hand painted faux ivory resin sculptures in lacquered finish. Dragon pencil cup has a distinguished carved wood appearance enhancing any executive desk. 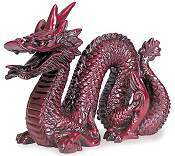 Hong Tse stone resin sculpture with a high gloss Rosewood finish with intricate carved detail. The dragon with Pearl is an ancient and powerful Feng Shui symbol directing prosperity, wisdom and good fortune to the individual or enterprise. Hong Tse stone resin sculpture with a highly polished Rosewood finish. Gold Chinese Dragon figurine with Pearl is guarding a mountain of gold coins, ingots and treasure bags. The dragon with Pearl is an ancient and powerful Feng Shui symbol directing prosperity, wisdom and good fortune to the individual or enterprise. Hong Tse stone resin sculpture with a polished antique gold finish.